JEE Main 2019 Admit Card for First/ 1st Attempt exam is to be Available for download From 20th march at jeemain.nic.in. Candidates must download the JEE Main Admit Card 2019 to appear for the Joint Entrance Examination. Candidates, who have registered for JEE Main 2019 and have submitted Application Form, are eligible to download the Admit Card of JEE Main 2019. Check step-by-step procedure for the JEE Main 2019 Admit Card download from below links. Admission criteria to Undergraduate Engineering Programs at NITs, IIITs, Other Centrally Funded Technical Institutions, Institutions funded by participating State Governments, and other Institutions shall include the performance in the class 12/equivalent qualifying Examination and in the Joint Entrance Examination. The Admit Card can be downloaded from JEE (Main) website from 20th march 2019 onwards. The candidates are advised to download their admit cards from JEE (Main) website only.The Candidates are also advised to regularly see JEE (Main) website for updates. A call centre will also be functional on all working days from 9.00 AM to 5.30 PM for general facilitation. The phone numbers of the call centre are available on the website of JEE (Main). About JEE (Main) 2019: Mode of Examination The Paper-1 (B.E./B. Tech.) (described below) of JEE (Main) will be conducted in two separate modes i.e. Offline (Pen and Paper Based Examination) mode and Online (Computer Based Examination) mode. The Paper-2 (B. Arch./B. Planning.) of JEE (Main) will be conducted only in Pen and Paper based examination mode. A candidate will opt for either Pen and Paper Based or Computer Based examination modes for Paper-1 (B. E./B. Tech.) only. Candidates can download their Admit Card for JEE Main 2019 from 20th march. Only students who have registered for JEE Main 2019 will be eligible to download the JEE 2019 Hall Ticket. To download Admit Card of JEE Main 2019, candidates must log in to enter their JEE Main 2019 login using Application No and Password. Candidates have to verify the details and click on the download option to avail the Joint Entrance Examination Main 2019 Admit Card. Candidates can print the JEE Main 2019 Admit Card after downloading it. In case of any discrepancy in the details, candidates have to immediately contact the JEE Main authorities. Candidates will not be allowed to appear for the JEE Main 2019 exam without a valid JEE Main 2019 Admit Card. Candidates are required to carry a the copy of the document specified below along with the Admit Card of JEE Main 2019 to the exam hall. JEE Main Admit Card Date: According to information mentioned in JEE Main 2019 information brochure the admit card will be released and made available the examination authority CBSE from Released From 20th march. The table given below shows the important dates pertaining to JEE Main 2019 admit card. How To Download JEE Mains Admit Card/ Hall Ticket 2019? 2. Admit Card: The JEE Main 2018 Admit Card will be displayed with all details of the candidate. 3. User Verification Process: Candidates must check and verify that all the details mentioned in the Admit card of JEE Main 2019 are correct else they have to contact the JEE Main authorities immediately. 4. After Verification completed, Click on the Download JEE main Admit card Button. 5. Candidates can print the JEE Main 2019 Admit Card using the print option. Please check the Admit Card carefully for your Name, Paper, Date of Birth, Gender, Test Centre Name, City, State Code of Eligibility and Category. In case of any discrepancy, communicate to JEE (Main) Secretariat immediately for necessary action. 3. Candidates are advised to reach the venue at least 2½ hours before the examination so as to complete the frisking and registration formalities well before the time.Registration desk will be closed 05 minutes prior to the examination. 5. The candidates claiming the relaxation under PwD category must carry with them the copy PwD certificate in the prescribed format (Appendix 9) issued by the Competent Authority. 6. No candidate, under any circumstances, will be allowed to enter the Examination Centre after the commencement of the examination. 7. A seat indicating roll number will be allocated to each candidate. Candidate should find out and occupy their allotted seat only. Any candidate found to have changed room or the seat on his/her own other than allotted, his/her candidature shall be cancelled and no plea would be accepted for it. 8. The candidate should ensure that the question paper available on the computer is as per his/her choice of medium. In case, the question paper is in medium other than his/her choice, the same may be brought to the notice of the Invigilator concerned. 9. No Candidate will be allowed to carry any baggage inside the Examination Centre.JEE Apex Board will not be responsible for any belongings stolen or lost at the premises. 10. Candidates are not allowed to carry any textual material, Calculators, Docu Pen, Slide Rules, Log Tables, Electronic Watches with facilities of calculator, printed or written material, bits of papers, mobile phone, pager or any other device, except the Admit Card, identity proof, document as required under point no. 5 of para 7.1inside the Examination Room/Hall. If any candidate is in possession of any of the above items, his/her candidature will be treated as unfair means and his/her current examination will be cancelled & he/she will also be debarred for future examination(s) & the equipment will be seized. 11. Smoking and eating is strictly prohibited in the examination room. 12. Tea, coffee, cold drinks or snacks are not allowed to be taken into the examination rooms during examination hours. 13. Approach the CentreSuperintendent/Invigilator in the room for any technical assistance, first aid emergency or any other information during the course of examination. 14. No candidate, without the special permission of the Centre Superintendent or the Invigilator concerned, will leave his/her seat or Examination Room until the full duration of the paper. Candidates must follow the instructions strictly as instructed by the Centre Superintendent/Invigilators. 15. For any queries or issues regarding computer based examination, the candidates may contact on toll free Call Centre No. which will be available on JEE (Main) website later on. 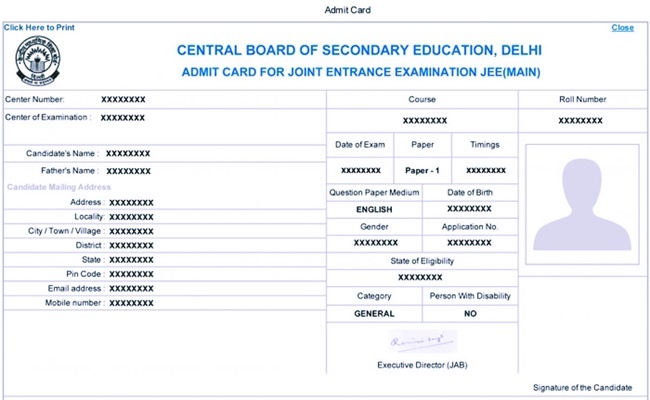 1.4 How To Download JEE Mains Admit Card/ Hall Ticket 2019?